Moisture and precipitation distribution governs life in the tropics. Surplus heating and rising motion in the tropics ignites the global water and energy cycles and influences weather in the midlatitudes. 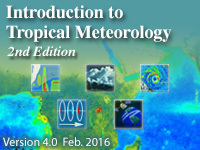 This chapter presents the horizontal and vertical distribution of water vapor, tropical cloud formation and distribution, the lifecycle and precipitation characteristics of tropical mesoscale convective systems, and the variability of tropical precipitation on yearly, seasonal, and hourly time-scales. this is on the job training, as well as school. Very useful and relate to my work. I learned a lot about precipitation patterns for various locations around the tropics. Excellent Module. Take note of the rainfall plots. Excellent courses, IT help build my profession working at a National Meteorological Service. good lesson for aeronautical forecasters as it gives a deep knowledge on water vapor and precipitation. Its also very educative and interesting too. "The target audience includes undergraduate students who have completed introductory meteorology and who know basic thermodynamic and dynamic meteorology. But the potential audience will encompass early graduate students and forecasters with a broad range of education and experience." I think the module is complicated for the beginners and its skill level is much higher. The module is akin to a scientific paper delineating the characteristics of tropical meteorology in a perplexing manner.